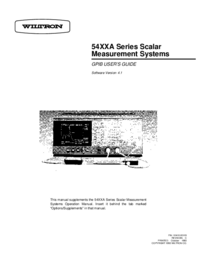 The 54XXA is a microprocessor controlled scalar measurement system. This system is used to make scalar (magnitude) transmission, reflection, and absolute power measurements. A typical model is shown in Figure 1-1 (facing page). All measurement functions are selectable by using the front panel keys and controls together with the display screen menus. Section III describes this mode of operation. All 54XXA front panel control functions (except POWER on/off) are programmable via the IEEE–488 Interface bus (GPIB). This function can be ordered as an option on all models (refer to paragraph 1-6). Remote operation of the 54XXA using GPIB commands is described in the GPIB User’s Guide for the 54XXA Series Scalar Measurement Systems that is located behind the Supplements/Options tab at the rear of this manual. The measurement frequency range of the 54XXA is determined by: · The range of the internal signal source of the particular model. · The external SWR Autotester and/or detector used with the 54XXA. 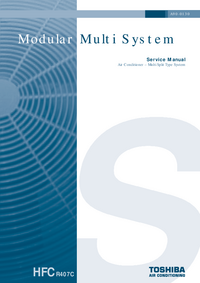 Chapter 1 — General Service Information This section provides a general description of series 54XXA Scalar Measurement Systems, system serial numbers, and frequency ranges. It explains the level of maintenance covered in this manual and provides preventative maintenance procedures. It also contains static-sensitive component handling precautions and a list of recommended test equipment. Chapter 2 — Replaceable Parts This Chapter lists all replaceable subassemblies and components for all 54XXA models. It explains the Wiltron exchange assembly program and provides parts ordering information. Chapter 3 — Troubleshooting This chapter provides information for troubleshooting 54XXA Scalar Measurement Systems. The troubleshooting information and fault location tables contained in this chapter support fault isolation down to a replaceable subassembly. Chapter 4 — Functional Overview This chapter provides descriptions of the functional operation of the major assemblies contained in 54XXA series Scalar Measurement Systems. The operation of all major circuit blocks is described so that the reader may better understand the function of each major assembly as part of the overall operation of the 54XXA. Chapter 5 — Removal and Replacement Procedures This chapter describes how to gain access to the major 54XXA assemblies and parts for troubleshooting or replacement. Chapter 6 — Adjustments This chapter provides adjustment procedures for all models of series 54XXA Scalar Measurement Systems. These procedures are used after replacement or repair of one or more critical subassemblies, or as indicated by the Performance Verification Procedures (which are contained in Section V of the Series 54XXA Scalar Measurement Systems Operation Manual). Appendix A — RF Detector Diode Replacement Procedures This appendix contains rf detector diode replacement procedures for 5400-71XXX and 560-7XXX series RF Detectors. 54XXA MM i Appendix B — Fabrication of RF Detector Simulator This appendix contains information for fabricating the T1492 RF Detector Simulator test aid. This test aid is used in the calibration procedures contained in Chapter 6. Appendix C — Fabrication of Dummy Thermistor Test Aids This appendix contains information for fabricating the T38300 Dummy Down Converter Thermistor and the T38301 Dummy Directional Coupler Thermistor test aids. These test aids are used in the Temperature Compensation Adjustment Procedure for series 54XXA Scalar Measurement Systems contained in Chapter 6. 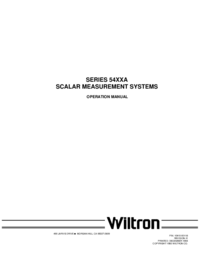 Tab / Section Title 1 SECTION I — GENERAL INFORMATION Contains a general description of the Wiltron Series 54XXA Scalar Measurement Systems, product identification numbers, related manuals, accessories, and options. SWR Autotesters and detectors used with these systems are described along with precautions for use of these Accessories. System specifications are listed and a list of recommended test equipment is provided. 2 SECTION II — INSTALLATION Contains information for the initial inspection and preparation of the 54XXA system. Explains how to set the rear panel Line Voltage Module and provides information for connection to the rear panel GPIB connectors and other input/output connectors. 3 SECTION III — FRONT PANEL OPERATION Describes the front panel controls and connectors of the 54XXA and the menus associated with the front panel keys. Explains the measurement screen display and annotation and describes the overall operation of the system using these controls, menus and display. 4 SECTION IV — MEASUREMENT AND CALIBRATION PROCEDURES This section describes measurement and calibration procedures used with 54XXA Scalar Measurement Systems. The specific procedures described are: self-test, calibration, and procedures for transmission, return loss, power and alternating setup measurements. 5 SECTION V — PERFORMANCE VERIFICATION PROCEDURES This section contains procedures for verifying the performance of Series 54XXA Scalar Measurement Systems to the specifications listed in Section I. 6 APPENDICES Contains tables that describe 54XXA Error/Warning Messages, Front Panel LED Error Codes, and Printer Switch Settings. A Rear Panel Layout and Connector Location Diagram and connector pinout diagrams are also included. 7 SUPPLEMENTS/OPTIONS GPIB USER’S GUIDE — Contains information for operating the 54XXA Scalar Measurement System with the IEEE-488 General Purpose Interface Bus (GPIB). The set of GPIB command codes for the 54XXA are described, and example programs showing use of the GPIB command codes are included. 7 SUPPLEMENTS/OPTIONS (Continued) Also included behind this tab are three application notes that contain information about test applications and GPIB programming for 54XXA Scalar Measurement Systems: 5400A-2 Data Sheet for 54XXA Scalar Measurement Systems Part No. 11410-00100 AN5400A-1, Testing Microwave Amplifiers Part No. 11410-00081 AN5400A-2, Testing Microwave Mixers Part No. 11410-00082 AN5400A-3, Programming the 54XXA Systems Using Microsoft QuickBASICâ Part No. 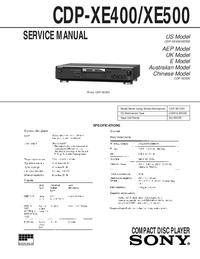 11410-00083 8 COMPONENTS Series 560 Autotesters Operation and Maintenance Manual,Part No. 10100-00028. GPIB USER’S GUIDE This User’s Guide provides information for operating Series 54XXA Scalar Measurement Systems with the IEEE-488 General Purpose Interface Bus (GPIB). All 54XXA GPIB commands (i.e., Product Specific Commands) are listed and described. The set of IEEE-488 Interface Function Messages recognized by the 54XXA are listed and the 54XXA response described. Included is a brief description of the IEEE-488 General Purpose Interface Bus hardware and the bus data transfer and control functions. The information about the IEEE-488 Interface bus presented in this manual is general in nature. For complete and specific information, refer to the ANSI/IEEE Std 488- 1978 document entitled “IEEE Standard Digital Interface for Programmable Instrumentation”. This document precisely defines the set of dedicated hardware signal lines, Interface functions, protocols, and messages for the Interface bus. 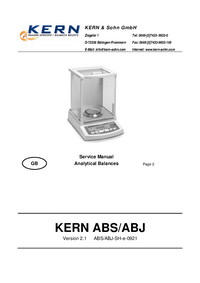 This manual is intended to be used in conjunction with the Series 54XXA Scalar Measurement System Operation Manual. Refer to that manual for information about equipment set up for GPIB operation and installation of the National Instruments GPIBPCII/ IIA Interface card and associated Software. For additional information about use of 54XXA systems with the IEEE-488 GPIB bus, refer to Application Note 5400A-3 (located behind this manual).